29-year-old Aly here. 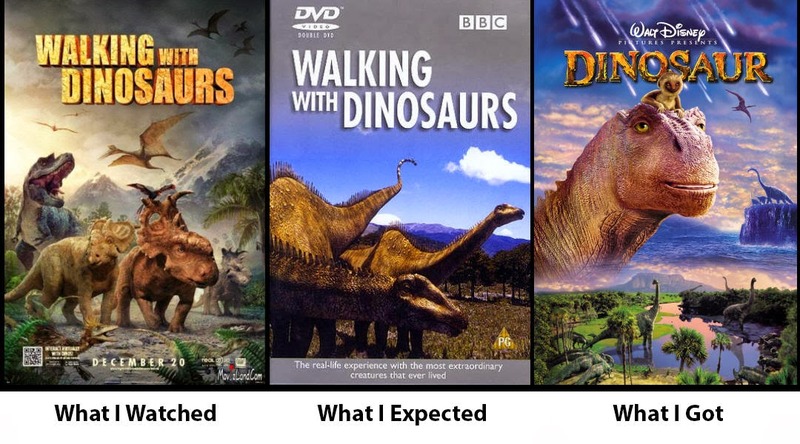 A while ago, I saw Walking With Dinosaurs in 3D, figuring it would make for a good 8-year-old review. But unfortunately shortly after returning from the cinema, 8-year-old Aly was suddenly unwell, and is now in his room with a hot toddy. NO! YOU CAN'T KEEP ME LOCKED UP FOREVER! THE PEOPLE MUST KNOW! Right. That's quite enough gifs.This isn't tumblr, Aly. Once upon a time, there was a remarkable documentary series produced by the BBC. 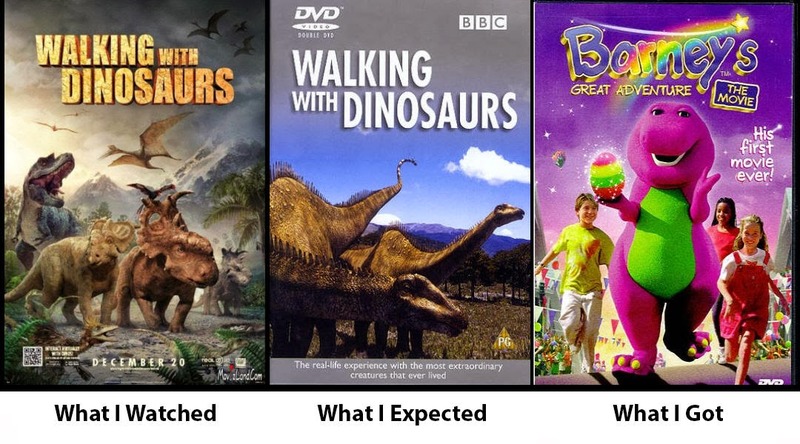 It was called Walking With Dinosaurs. It was commissioned in the late 1990s. Jurassic Park showed the possibilities of what could be achieved with computer animation and advanced animatronics - dinosaurs more lifelike and compelling than any which had appeared before. Prior documentaries relied either upon stop-motion animation, drawn animation, or puppetry to bring dinosaurs to life: even then, they were relegated to parts of a program, never sufficient to carry an entire episode. You had some incredible features like Dinosaur!, Dinosaurs!, The Dinosaurs! (along with Dinosaurs Alive! evidently exclamation marks were A MUST HAVE), The Animal World, Journey to the Beginning of Time, Dinosaurs: Fun Fact and Fantasy, Muttaburrasaurus - Life in Gondwana, Dinosaurs & Other Strange Creatures, and the like. The Walking With series marched on to different time periods and formats: The Ballad of Big Al, Walking with Beasts, Walking with Cavemen, Walking with Monsters, The Giant Claw and Land of Giants, Sea Monsters, and Prehistoric Park, the last four featuring Nigel Marvin desperately striving not to be eaten, gored, thagomized, trampled or otherwise imperiled. Clearly he's the little man who's waving when he should be running. After the success of Walking With Dinosaurs came a new wave of incredible documentaries which depicted long-extinct creatures in the fashion of living, breathing beings: When Dinosaurs Roamed America, Dinosaur Planet, Dinosaur Revolution, and what I consider to be the superlative dinosaur documentary, Planet Dinosaur. And even the ones which aren't quite as excellent in terms of palaeontological fidelity, the fact that documentaries like Monsters We Met, March of the Dinosaurs, Dinosaurs Alive, What Killed The Mega Beasts?, Giants of Patagonia, , Prehistoric Denver/Dallas/Los Angeles/New York/Washington/Chicago, The Truth About Killer Dinosaurs and many more have been commissioned shows just how incredible a cultural phenomenon Walking With Dinosaurs became. Yet over ten years later, the Walking With Dinosaurs name & brand remains potent: video games, models, books. A few years ago, I attended Walking With Dinosaurs - The Arena Spectacular, a grand spectacle which brought the idea of depicting dinosaurs as animals into the public eye. It was one of those occasions where 29-year-old Aly just had to sit back and let 8-year-old Aly take over, suspending disbelief just enough to momentarily let me think these were really there. Clearly, then, Walking With Dinosaurs is still a force to be reckoned with. A theatrical feature - and a 3D one at that - seemed like such a great idea. Finally, dinosaurs up on the big screen! Not anthropomorphised cartoons, not the monstrous villains of action films: the closest we could get to a live-action dinosaur documentary until we master either genetics or time-travel! And at its core, it's still a great idea. It's just something horrible happened on the way to cinemas. Is this to be the fate of all dinosaur films? Q: Were there any projects that you missed out on that you wish you had worked on? I was really curious when you mentioned the Verhoeven/Disney/dinosaur thing. Phil Tippett: I wasn’t sad when we got kicked off of [that], because we could tell where it was going to go. [2000’s Dinosaur]. Walon Green had written a really nice script, and the idea was basically to make a silent movie. [The dinosaurs] weren’t going to talk, and they weren’t going to have eyelashes, and there weren’t going to be any songs. It was just going to have a symphonic score and sound effects. We pitched it like a Disney documentary. And they did what a lot of studios do, they just kind of mine you for whatever you’ve got, and then they’ll start pushing you down their path. And at a certain point, we were just intractable and said, “This isn’t the movie we wanted to make,” and they said, “Okay, bye.” In fact, I blew off some meeting with Jeffrey Katzenberg and thought, “This was a waste of time,” and I was banned from Dolby Drive for five years until he left. Spielberg's first concept was doing a film like BAMBI, only with dinosaurs. It would tell the story of a young dinosaur growing up in prehistoric times; similar to the dynamics of the "Rite of Spring" sequence in Disney's FANTASIA. In fact, Spielberg envisioned the entire film with no dialogue. From this rough concept, the film grew to include several young dinosaurs. Eventually it was believed that the film couldn't carry a storyline without dialogue. Don recalled the origin. "THE LAND BEFORE TIME was actually a concept before it was a story. Spielberg said, 'Basically, I want to do a soft picture that does not have a real driving plot. It's about five little dinosaurs and how they grow up and work together as a group.' We agreed that the Tyrannosaurus Rex would be a great villain. As we talked, we decided this would be more of a pastoral kind of picture. It needs to be symphonic in nature, soft and gentle." Ever since the "Rite of Spring" sequence became one of the most iconic scenes in Disney's Fantasia, it seems like a lot of people are pretty darn interested in presenting dialogue-free dinosaurs-as-animals films... only to have that snatched away and turned into yet another run-of-the-mill anthropomorphised cartoon. How many times is this going to happen!?! From a purely economic standpoint, though, an $80 million family film, released over Christmas, with no dialogue or narration? You can see why executives might've blanched at such a seemingly bold venture. But is it that bold? Wall-E went its first 40 minutes - a third of its running time - with virtually no dialogue outside of a few lines and words; Disney returned to Fantasia over a decade ago to take IMAX by storm; The Artist showed that silent films in general can still be viable in modern cinema. I have no illusions that silent or near-silent films would be hard sells in modern Hollywood, but I'd hardly consider them impossible. But perhaps I was hoping for too much. In a couple of years I'd watch Koyaanisquatsi and be moved by a film with no dialogue, characters, or plot, and though I think even 8-year-old Aly would be transfixed by the very presence of DINOSAURS on the screen, it's clear I don't speak for most children. So I guess the test audiences might've had a point: while all children love dinosaurs, not all children love sitting still in a dark room with scores of other children for an hour and a half. Sacrifices had to be made, and since test audiences apparently found the story too hard to follow, some voiceover was considered. Well, the obvious route seemed - to me - to be to go the Dinosaur Revolution path, and just have a narrator explain wee dinosaur facts as the story plays out. "Pachyrhinosaurus were early relatives of Triceratops: while they had their more famous cousin's frill and beak, instead of three horns, they had a thick boss on their nose, and a short, thick horn on their forehead," like that. They could cast one of the usual suspects for this sort of thing: Stacy Keach, Mike Rowe, James Earl Jones, Keith David, Morgan Freeman, John Hurt, Sigourney Weaver, Susan Sarandon, Tilda Swinton. Or get a genuine scientist. Or even get one of the many Hollywood stars who's mad about dinosaurs - it's how Richard Branson got the BBC gig. They got John Leguizamo. Doing a wacky Latino accent. The Powers That Be™ decided to cast not one of the great voiceover actors of the industry, nor even a genuine scientist like Attenborough or Sagan, but a bizarre cartoon stereotype. Despite Walking With Dinosaurs already proven to be a phenomenal success. Despite March of the Penguins showing theatrical documentaries can do well for families. Despite both Cook and Nightingale having proven they can do pretty good work. OK, fine. As it turned out, Leguizamo is the only thing introduced by TPTB™ which isn't a complete disaster. His Alexornis (shortened to Alex, because apparently children can't be expected to remember the names of prehistoric animals even though that is one of the great victories they can claim over their parents, along with "successfully operating new technology" and "crawling into small spaces") manages to squeeze in a few pertinent facts, and because Leguizamo is genuinely engaging and clearly invested in the subject matter, it works. Even the "humour" often works, because Leguizamo is actually funny. Do you know what isn't funny in this film? EVERYTHING ELSE. But we'll get to that. So Leguizamo is charged with narration. Fine, I can deal with that. But that's not all. Evidently that wasn't enough for TPTB™: their clear lack of ability to follow even this basic, bare-bones (I REGRET NO PUNS) story translated to "well if I, a multi-million-dollar-earning executive, cannot understand it, CLEARLY little children have no chance, waffle waffle waffle!" and they put in the most superfluous framing device I've ever seen. Karl Urban takes his niece & nephew out on an excavation. The girl is excited, the boy is not: he isn't interested in musty old bones when he has his precious iphone. It's only when the descendent of Leguizornis appears and tries to convince him that dinosaurs are actually cool that he realises dinosaurs might actually be cool. BECAUSE IF THERE'S ANY DEMOGRAPHIC IN THE WORLD WHICH NEEDS TO BE CONVINCED THAT DINOSAURS ARE COOL, IT'S BOYS. OH, THOSE BOYS ARE SUCH A TOUGH DEMOGRAPHIC FOR THE DINOSAUR LOBBY! THIS IS HOW STUPID TPTB™ THINK WE ARE. They hastily cast and waste Karl Urban - KARL URBAN - as The Uncle You Would Trade Your Real Parents For In A Heartbeat and insult the intelligence of 3-year-olds by not only suggesting children won't understand that this is set in the past without a FRAMING DEVICE, but that somehow, somewhere, there are children in the cinema WHO NEED CONVINCED that DINOSAURS are INTERESTING. Why in blazes do you think these children are here if they have a moribund attitude to dinosaurs when dinosaurs are one of the few things that ALL CHILDREN LOVE. BUT THAT'S NOT ALL. Inigo Leguizamo wasn't enough. The pointless framing device wasn't enough. And as we'd later see, the subtle anthropomorphisation of the dinosaurs' movements and eyes wasn't enough. "I still can't follow this labyrinthine byzantine plot, so how can the leetle cheeldrens, nyarf nyarf nyarf, pass me more caviar snuff." So they added more voices. MORE VOICES THAT DO NOT SHUT UP. EVER. They didn't even do us the dignity of casting good voices: they cast the guy most famous as the insufferable Apple hipster from those intolerable Mac ads as our hero, the definition of a '90s Kid somehow displaced in the 2000s as his antagonistic brother, and someone who I can't really say anything pettily nasty about even though I really want to because I'M SO ANGRY LET ME BE PETTY FOR ONCE as the love interest. Now, maybe they wouldn't have been too bad if the script was goopphhhhhmmmbwahahaha oh for cryin' out loud didn't I just say THEY DON'T SHUT UP. BECAUSE THEY DON'T. Any, ANY, possible goodwill that could've been gained by the implementation of voiceovers is lost when they DO. NOT. GIVE. US. A. MOMENT'S. PEACE. TPTB™ have seemingly accepted the notion that children cannot sit still for five seconds, and so must be constantly bombarded with stimulae to hold their attention. 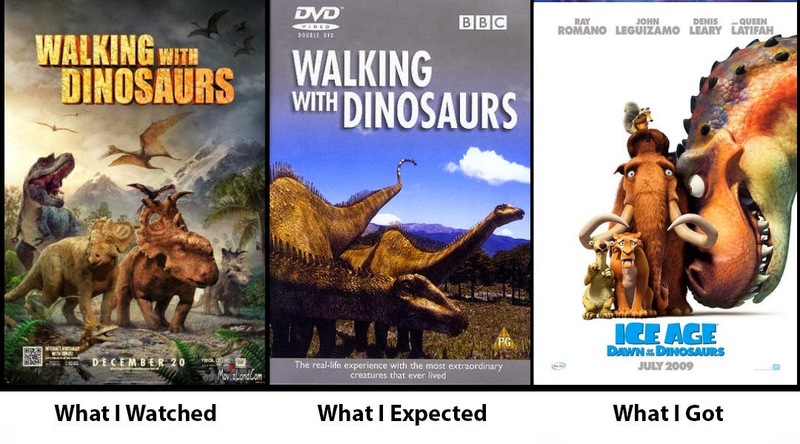 In a movie which is 90% composed of DINOSAUR. DINOSAUR not enough to capture attention. Somehow. So they talk. And talk. And talk. And talk. And talk. And talk. And talk. And talk. And talk. And talk. And talk. And talk. And talk. And talk. And talk. And talk. And talk. And talk. And talk. And talk. And talk. And talk. And talk. And talk. And talk. And talk. And talk. And talk. And are you getting the hang of it yet? And talk. Even when a scene would be perfectly understood unaccompanied by expository dialogue, they talk. Even when a scene is more powerful and affecting when words are left unsaid, they talk. Even when the talking actively HINDERS the storytelling and makes things MORE CONFUSING, they talk. In attempting to appeal to the lowest common denominator, it is nothing short of astounding that they managed to confuse 29-Year-Old Aly simply because TOO MANY DINOSAURS WERE TALKING AT ONCE. What universe am I in where that sentence ever needed to be uttered? But I see what they might've been trying to capture. There was a lovely tv show, also by the BBC, called Animal Magic. It was simple enough: Johnny Morris went to the zoo, and gave voices to the animals. It worked because it was spontaneous, because Johnny Morris was funny, and because - this is the big part - the animals were real. They weren't computer-rendered, they weren't meticulously designed and researched and rigged and textured and foleyed - they were just normal animals being themselves. The anthropomorphisation was thus a connection across species boundaries, without ever forgetting that you are seeing real animals with minds, bodies and motivations which may be superficially similar to those of humans, but which are nonetheless alien. That cannot happen with Walking With Dinosaurs IN 3D because every single motion, flinch, sound and action made by the dinosaurs is the result of YEARS of work by artists, programmers & researchers, building upon decades of palaeontological discovery. Any anthropomorphisation is caused not by observation - the part of the observer applying human elements - but through the very design of the things. It's a huge difference, in my opinion. But really, it boils down to the fact that it just isn't funny, engaging or informative, and is so grossly disjointed from the rest of the film that it's a constant distraction. It's a bit like having drunk Mystery Science Theatre fans giving a running commentary there in the cinema, only this time the ushers can't do anything about it, and you can't ask for a refund because that's how the film was "supposed" to be. It's like a person who doesn't actually understand comedy saw Walk On The Wild Side or The Spider That Couldn't Hide and decided the humour was from the mere fact that THAT ANIMAL HAS PEOPLE VOICE as opposed to taking observed animal behaviour and juxtaposing them with human behaviour. Yet even so, there's another major issue here - that in giving each animal an internal voice, and thus a character and character arc, this ceases to be a documentary (even a pseudo-documentary) and becomes a traditional, bog-standard, cut-out, run-of-the-mill family film. The runt of the litter undergoes trials & tribulations, finds a girl, loses the girl, nearly gives up on life until he realises he can't live without her, proves his mettle, wins the fight and gets the girl again. In giving these animals definite human voices at the expense of their animal nature, you're applying human behaviour to animal behaviour. This is rather problematic when behaviour which is entirely natural to animals - the strongest male being able to claim the "prize" of his brother's female, females & weaker males utterly supplicant to the dominant male, violence solving everything from family disagreements to survival situations - is accompanied by decidedly human voices.What I'm saying is it's a wee bit confusing to go from applying tongue-in-cheek anthropomorphism which is intentionally silly and fun, to using it for dramatic tension. "I love Patchi, but his brutish bully of a brother beat him up in a fight and left him for dead, so he wins leadership of the herd and the right to father my offspring regardless of my feelings on the matter. OH WELL, NO POINT IN COMPLAINING. Good thing I'm not sapient or anything, or this would be pretty bleak." 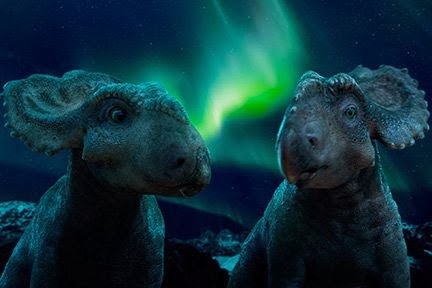 But perhaps the most heartbreaking thing about Walking With Dinosaurs IN 3D is that there is a truly, genuinely, absolutely WONDERFUL film in there. If you bring earphones and your favourite Vangelis tracks, you can imagine you're watching some strange, avant-garde silent film. Certainly I can't see the story, such as it is, suffering from the complete extraction of the dialogue & pop songs (Barry White? Sanford Clark? FLEETWOOD MAC!?! ), and you'll save yourself a lot of gurning at the screen. 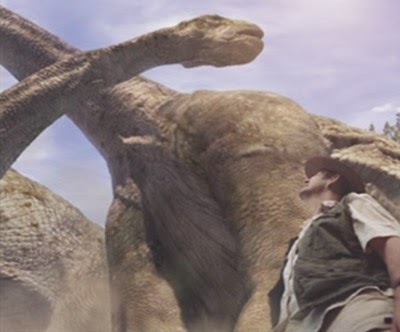 Apparently, the 3D/Blu-Ray/DVD combo edition will feature something called the "Cretaceous Cut," billed as the "natural version" of the film - hopefully this means the version that the directors originally envisioned. Pretty freakin' lame of the studio to only put it on the super-duper combo edition, unless they're going to release a stand-alone DVD for those of us who haven't gone Blu-Ray yet. So there's a possibility that the small screen iteration may salvage what was ruined on the big screen. But man, what a loss. What a waste. Clearly, 8-Year-Old Aly is The Film Reviewer I Would Trade My Real Film Reviewers For In A Heartbeat.